Every year, the international community puts the spotlight on TB by highlighting World TB Day on March 24. It is a globally recognized occasion for people around the world to stand in solidarity with the millions of people who suffer from TB, and the millions who have lost their lives. World TB Day is also a time to increase our efforts and push for greater investment towards fighting this epidemic. This year marks the 6th replenishment of the Global Fund to Fight AIDS, TB and Malaria for 2020-2022. Canada has been supporting the Global Fund since its inception in 2002 and we are calling on the government of Canada to continue this exemplary leadership and commit to a bold pledge of $1 billion (CAD). While we are making progress against this ancient disease, a lot more must be done. The Global Fund plays a vital role in this progress by ensuring that people receive life-saving drugs, have access to diagnosis, and are supported through community-driven care. 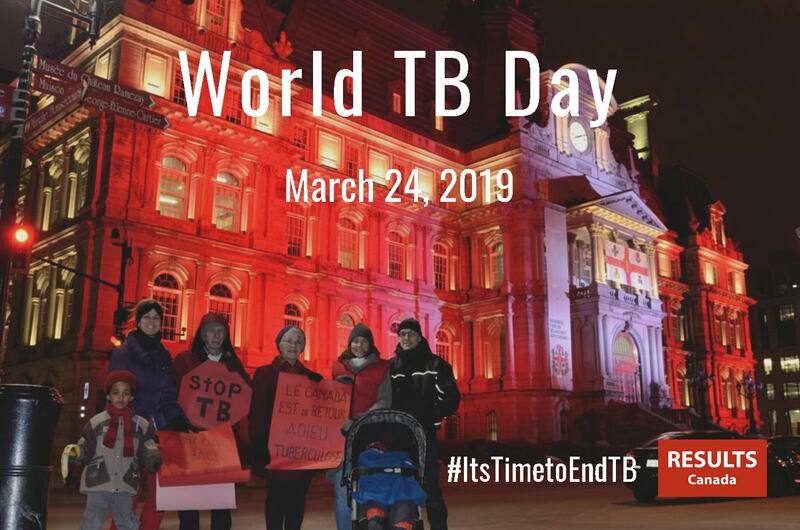 To show solidarity and remind the government of Canada that it’s time we end TB, engaged volunteers are taking action across the country this March 24 by lighting up monuments in red and hosting awareness-raising events. What can you do? Join us! On March 24, find the nearest landmark or building lit up in red, take a photo and share it on social media by tagging your Member of Parliament (MP). Use the hashtags: #ItsTimeToEndTB, #WorldTBDay2019 and #voices4RESULTS. The BC Provincial Legislature, the Capital Regional District Building and the City Hall will be lit up in red. Take photos and share them on social media! And keep an eye out for a proclamation by the Mayor! Join the Calgary group for a meeting from 6:30 to 9pm (SAHLA, 205-1409 Edmonton Trail NE, Calgary) and then join them for a group photo with the Calgary Tower as a back drop. Contact the group for more details. The CN Tower and the TORONTO sign will be lit up in red. Take photos and share on social media! On Friday March 22 from 1-1:30pm, there will be the 3rd annual Toronto World TB Day gathering at Nathan Philips Square organized by Toronto Public Health. Hear from TB patient advocates and be part of the group photo! Citizens will get together the historic Byward Market at the Ottawa sign at 4:15pm to grab hot chocolate and take a group photo. Contact the group for more details. Stop by Tory Tunnels between 11am and 5pm on Thursday March 21 to take action and learn more about the Global Fund and TB. Contact the group for more details. The Montreal Tower will be lit up in red. Join a group to take a photo at 7:30pm at street Pierre Coubertin. Contact the group for more details. Participate in the solidarity event from 7 until 9pm at the Amalgame restaurant at 652 1st Avenue West in Amos. There will be a film screening, discussions and actions taken! Contact the group for more details.